It had been a long time since I attended an Indiblogger meet, the last time it was in Bangalore but then I shifted to Lucknow and all I could do was to read frequent meets that happened and be envy about it. However, I landed in Mumbai for my internship and I was overjoyed to see that there is a Quaker Bowl Indiblogger meet scheduled for the coming weekend. I waited patiently and finally the day came. It all started with a little contest from IndiBlogger and QuakerIndia where everyone had to tweet about the tastiest breakfast mom ever made and throughout the time till I reached the venue I kept thinking about it. It is tough to choose the best among the bests as I liked anything, everything mom made, however, the delicious omelettes in the morning were my all time favorite. The event started but came a little twist and surprise with the welcome tune of Taher Shah's Mankind Angel playing on the big screen. It was followed by entry of the mystical man aka Vineet Rajan taking the stage. An icebreaker time where we all did our little weird but fun exercises to gel ourselves in the surroundings. Indiblogger had kept the biggest surprise of the day "#QuakerBowl with Celebrity Chef" under curtains and that was revealed soon with the entry of the man about whom girls go crazy and needless to say that my fellow classmate from college has a huge crush on him. 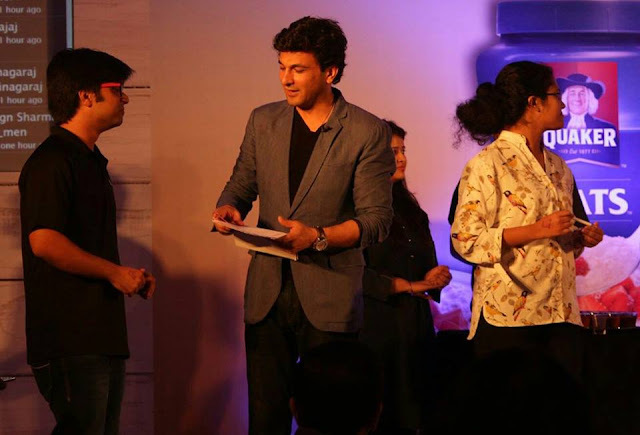 It was none other than Michelin starred chef, restaurateur, and cookbook writer Vikas Khanna. He began with a little introduction and that was followed by a fun quiz. Though I didn't know the answer of any but it was good to learn certain facts like Pampore is known as Saffron Town of Kashmir! Like always the best thing was yet to happen - a fun challenge where one had to drink soup in one go from a tequila shot glass and tell its ingredients within 60 seconds. I was among the one chosen by Vikas Khanna to perform the task and I could guess only two; Salt & Water. Nothing could be more embarrassing when you are the worst performer in a group but that was fun and moreover, I got a prize for coming last and it was given by Vikas Khanna himself that too on the stage. Yay! I had my first celebrity moment of the day and I also learnt an important lesson that one can make soup with Quaker Oats and was the main ingredient that I couldn't guess. It was followed by a team challenge where the task was to make a dish of our own choice with the available ingredients. I know nothing about cooking and that is very obvious from the ingredient guessing task and so all I did was to stand with the team and stare what they are doing that ended up making something that looked nice but tasty? that Vikas Khanna and his team had to decide and we didn't make it in the winning list. It was time for lunch and we all munched on the food. A tasty end to a fun meet that was followed by free gift. Yet again, Thank you Indiblogger and Thank you QuakerIndia for organising such an enjoyable gathering.